They came by plane, by train and by road. They came from seven countries and from different continents. They came to read and enjoy the work of an English novelist and story-teller – C. S. Forester. They met at the Royal Maritime Club in Portsmouth and recalled the days when Forester’s Hornblower lodged in nearby Highbury Street. They learnt about the state of the Royal Navy in the build-up to the Napoleonic Wars, identified the true person behind Hornblower’s Admiral Pellew, and saw how the lighthouse and semaphores at Pont Minou near Brest had developed since the 1800s. Above all, they compared and celebrated their experience of reading Forester’s work. 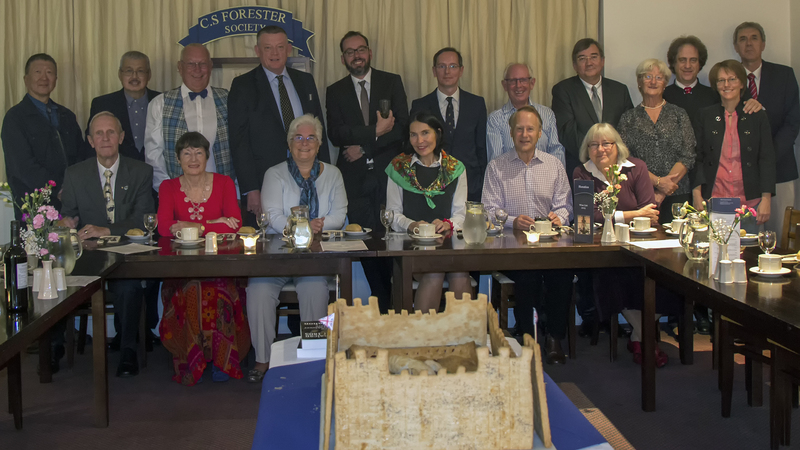 The C. S. Forester Society is 16 years old now and the recent demise of its founder Colin Blogg was noted with deep regret and affection. The Society plans to meet near Stockholm next year, where the Swedish Horatio Hornblower Society will kindly host the annual get-together. This year we walked the path which Nelson took in his last moments on land prior to Trafalgar; we identified the likely site of the Long Rooms where Hornblower had to play whist for a living; and we enjoyed the Captain’s hospitality with a tot of rum on board HMS Victory. There were so, so many high points in our weekend together but perhaps it is worth taking special note of the traditional Castle Pie dinner enjoyed by one and all on the Saturday evening. But above all we celebrate how the enduring quality of Forester’s prose, the timeless fascination of Hornblower and his other heroes – how it is that this mid-20th century English novelist, living his later years in USA, has inspired this enduring and friendly group to get together from around the world, and celebrate in peace each year.